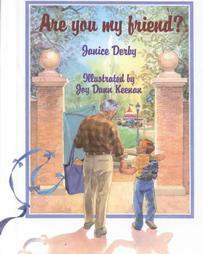 Storypath » Are You My Friend? Title: Are You My Friend? Literary elements at work in the story: Through a simple walk in the park, Derby introduces us to a wide range of people using a repetitive style that describes the differences we have along with the commonalities we share. Each encounter ends with the same question, “Are you my friend?” leaving us to ponder how relationships can rise above physical characteristics that are often used to divide us. How does the perspective on gender/race/culture/economics/ability make a difference to the story? This book covers all the things that tend to divide us– age, race, size, mental, cognitive, and physical abilities, economic status, and differing cultures in a way that is both sensitive and affirming. Of note is the inclusion of “smart” child and an “overweight” child (rarely identified as discriminating factors.) Yes, we are all different, but differences do not have to divide us when we take the time to notice how alike we are. In a note to her readers at the end of the book, Derby points out that sometimes when we see people who look different from us we are afraid. But when we take the time to wonder if they can still be our friend, we begin to see how much we are alike and how those likenesses matter much more than our differences. Theological Conversation Partners: Psalm 139 affirms the wonderful creativity of God, who, “formed my inward parts and knit me together in my mother’s womb. I praise you, for I am fearfully and wonderfully made.” How boring our world would be if we all looked the same and liked the same things! Our amazing God created each of us in a unique way with abilities and perspectives that help us form relationships that can grow into lasting friendships. When we focus on the many things that God has provided for us to celebrate together, we become a community of praise and gratitude. Look in the mirror alongside someone else in your family. How do you look different? How do you look similar? What physical characteristics make you uniquely you? Name five things that you enjoy or like to do. Who do you know who enjoys the same things? How are they like you? How are they different from you? Name your best friend. What makes this person your friend? How can you be a friend to someone who looks different than you? What would make you a good friend? We are happy to welcome Krista Lovell, 1983 graduate of the Presbyterian School of Christian Education (now part of Union Presbyterian Seminary), as a new book reviewer! Krista is a retired certified church educator and a lover of children’s books and telling God’s story! Welcome, Krista! Are You My Friend? by Storypath is licensed under a Creative Commons Attribution-NonCommercial 4.0 International License.